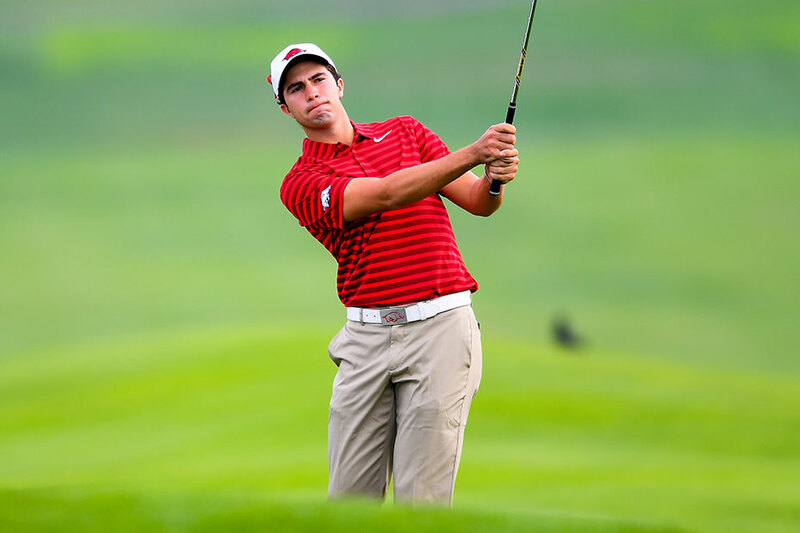 FAYETTEVILLE – Former Razorback Alvaro Ortiz, representing his native Mexico, shot a 6-under-par 66 and owns a three-stroke lead after the opening round at the Latin America Amateur Championship, played at Teeth of the Dog Golf Course in Casa del Campo, Dominican Republic. Current Razorbacks Julian Perico, representing Peru, is tied for 61st after an opening-round 77 and Luis Garza, representing Mexico, is tied for 84th at 8-over par. This is the fifth year of the Latin America Amateur Championship and both Ortiz and Garza have played in each of the previous four Championships. The winner will be invited to play in the 2019 Masters and receive exemptions into the final stages of qualifying for The Open and U.S. Open in 2019. Ortiz has finished among the top three at the Latin America Amateur Championship on three occasions (runner up in 2017 and 2018; third in 2015). He opened this year’s Championship with a birdie on the par-4, 10th hole, but gave that stroke back on the 12th. However, he would birdie five of his next seven holes – including three straight – to get to 5-under par through 10 holes. After three straight pars, Ortiz eagled the par-5 5th hole to move to 7-under par. He suffered a bogey on the 6th hole before finishing with three pars for his round of 66. Perico opened with a bogey but rallied to birdie holes 2 and 3. However, he suffered back-to-back double bogeys and made the turn at 4-over. He posted seven pars, a birdie and a double bogey on the back nine to finish at 5-over-par 77. Garza, who started on the back nine, made the turn at 2-over par, thanks to a birdie on the 15th hole. However, he carded a 42 on his back nine to finish with an 80. Round two of four-day Championship is set for Friday and coverage can be found on the ESPN family of networks. Two hours of live play will air on ESPN2 (Jan. 17, 18 and 20) or on ESPNEWS (Jan. 19), with the telecasts also available on the ESPN App.